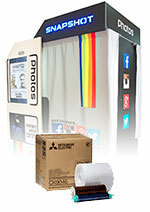 Home > Printer Supplies > Dye Sub Photo Printer Supplies > 4"x6" Media (600 Prints) for the LAI Snapshot Photo Booth. 4"x6" Media (600 Prints) for the LAI Snapshot Photo Booth. Order 2 boxes for Free Shipping (contiguous United States only).